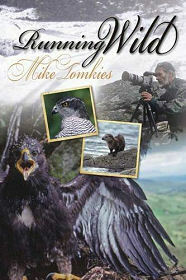 Mike Tomkies is something of a legend among British and worldwide naturalists. Born in 1928 in Nottinghamshire, he became a successful show business correspondence with The Times before he decided to get away from it all in 1966 and moved to Canada. Three years studying the resident wildlife resulted in his book "Alone In The Wilderness", which became an international bestseller. After further periods tracking Hollywood stars and Canadian wildlife he set up home on a tidal island in Scotland and wrote nine books about the wildlife in the West Highlands. He also began to study eagles, a subject that would retain a fascination for him for well over four decades in Canada, Scotland and Spain. In more recent times he has become as well known as a filmmaker as an an author and in 1988 he was elected an Honorary Fellow of the Royal Zoological Society of Scotland. He also became patron of the Scottish Wildcat Association in 2009, and spent his 83rd birthday filming nesting eagles in Galloway. "Running Wild" by Mike Tomkies picks up the story of his life as he drives off a ferry in Plymouth after spending five years filming wildlife in Spain. His assets amount to his remarkable reputation and a huge range of friends. contacts and enthusiastic readers, and "Mi Caballo", his faithful old VW Camper. We then follow the author as he travels around Britain, looking for places to say and more permanent residences that never quite seem to match his hopes and expectations, while he continues to film and write. Mike's style has an attractively timeless quality, so while events seem to be in sequence, there's nothing that says that a particular event took place at a particular time. What we have here seems to be a fairly complete story of the past few years of his life, told with particular regard to his passion for wildlife, and for eagles in particular. As such it will certainly appeal to his army of enthusiastic readers, while others less familiar with his earlier works will find an entrancing picture of aspects of wildlife conservation in the UK today, as seen through the eyes of someone who lives much closer to his subject than most of us will ever manage.